This is a really nice apartment full of natural light. 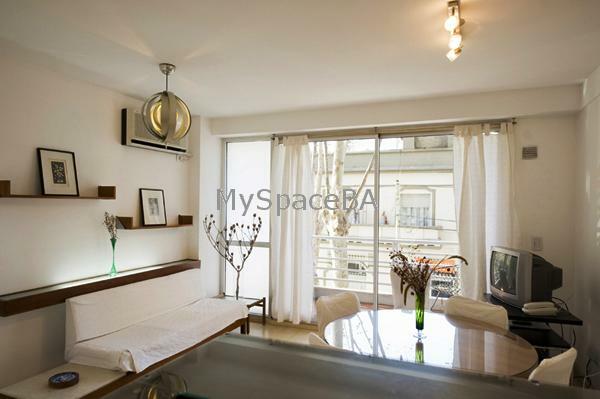 It has a beautiful balcony with wood floors which brings brightness to the living and kitchen. The living has a sofá with a tv and a round table to lunch. The floors are of parket. It has Air conditioner. The kitchen is full equipped. It has a microwave and a breakfast bar which communicates the kitchen with the living room. Renting the apartment you can use the terrace which has a precious swimming pool. Air Conditioner, TV Cable, Phone, parket floors, balcony. Downtown, metro station, bus stop, commercial area, residential area, bars, pubs, restaurants, coffe-shop, banks, exchange house. Included: All the taxes are paid by the owner.